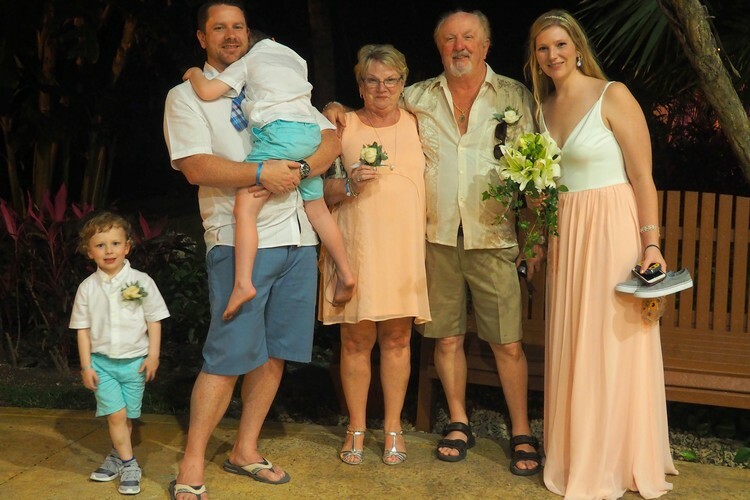 Five years ago, we made the decision to return to the Iberostar Paraiso del Mar Resort, located in Mexico’s Riviera Maya, to celebrate our 10 year wedding anniversary. When it came time to make the reservations for the trip, we thought about doing something extra special for this milestone moment. We wanted to include our boys and we wanted to do something big and memorable. That’s when the idea to have a vow renewal ceremony was hatched. 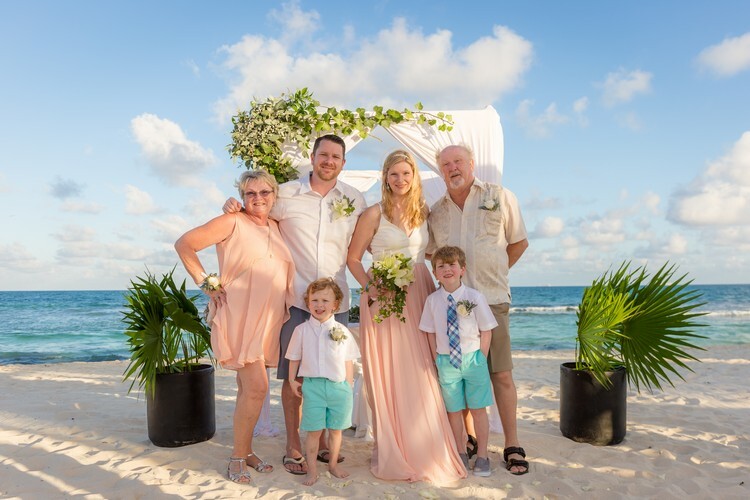 We know vow renewals are a thing, but we haven’t met anyone whose done a vow renewal – so we didn’t know what the ceremony entailed. Or even where to begin? 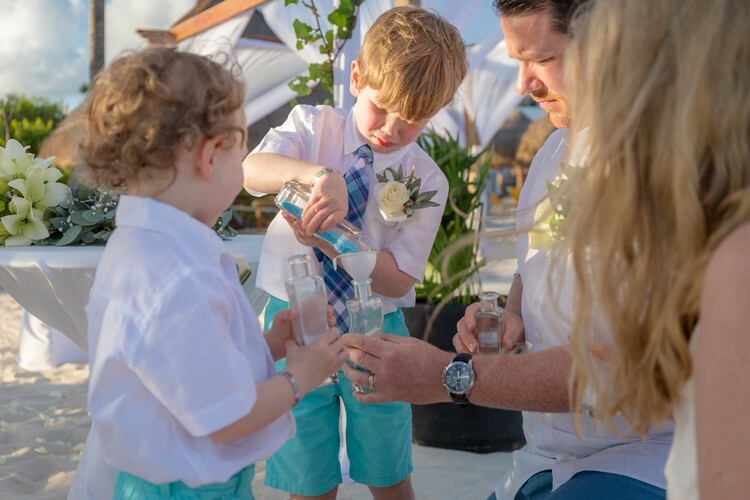 We had a great experience getting married at the Iberostar Paraiso del Mar, so we reached out to the resort to see if they hosted such events and what options were available. We were happy to learn they host vow renewals ceremonies all the time, so we didn’t have to worry about the details. The more we bounced around the idea, the more we liked it. 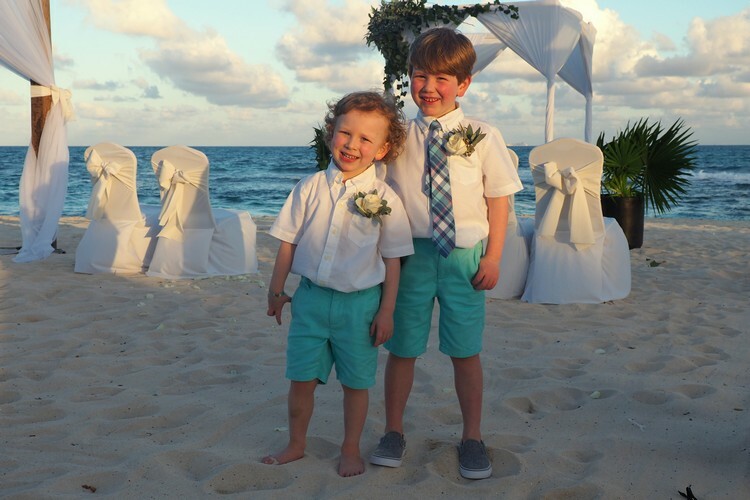 Doing a small ceremony on the beach was the perfect compliment to our family vacation and it allowed our boys to be involved. The planning process is easy. It’s similar to when we planned our wedding, so it felt familiar (it was also quite nostalgic!). 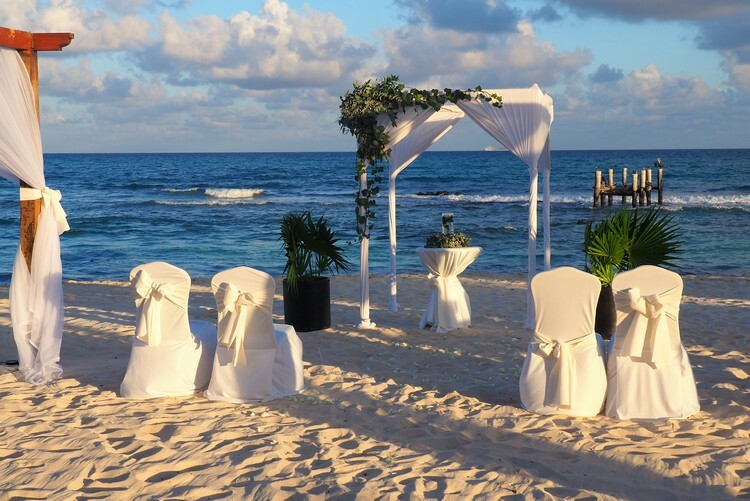 The Iberostar Paraiso del Mar uses its wedding packages and revises them for the vow renewal ceremony. We decided that we wanted our ceremony to be short, simple and elegant. The first step in the process is to choose your wedding package. We went with the Star Package, which is the most basic option. For our ceremony, we chose the beach location, instead of the gazebo location (which is more private and surrounding by water and trees). When we were married 10 years ago we chose the gazebo option because we wanted the privacy. The downside for the beach option is that there are lots of half naked people watching you. We decided to do the ceremony at 5:00 PM because we didn’t want it to be too hot and we hoped for a nice sunset. It’s also a better time for photos. This applies for the first 10 people. There’s an additional charge of $20 per person after that. Mireya was assigned as our wedding coordinator. All of our communication pre-trip was via email. She was very helpful with our planning and made us feel like we were in good hands. When we arrived, we met with our coordinator a couple days before the ceremony and confirmed the plans for the ceremony. The meeting was less than one hour. There are plenty of options available, like runners, bows, tiki torches, mariachi band, violinist and more. 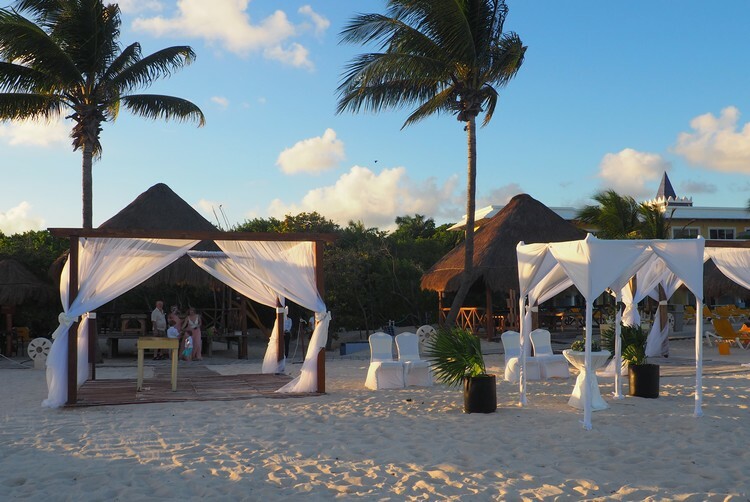 You can customize your ceremony to meet your expectations. Most requests can be accommodated. You’ll also need to pick songs for the ceremony. A high-tech sound system is available and there’s a person dedicated to managing the mic and music. They had our songs pre-loaded and the coordinator made sure the right songs were played at the right time. We opted for white linens and a simple décor. The standard flower options included gerber daisies or lilies. We chose white lilies for our flowers. You can see the set-up in the photos below. The resort has an on-site photographer, Adventure Photos. We met with them and went over our simple needs. The photographer came out for about 30 minutes and we selected about 20 photos. They gave us the original files (some are included in this post) and we also had a nice hard-copy photo album created. The ceremony was perfect. It was exactly what we hoped for. 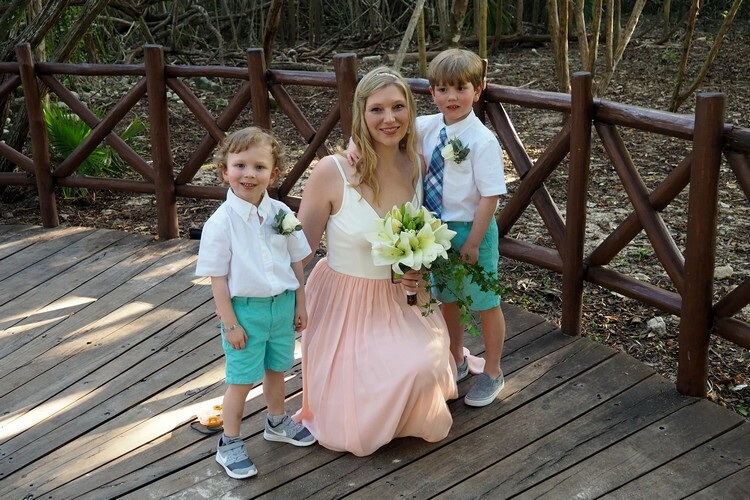 One of the reasons we chose the Iberostar Paraiso del Mar for our wedding (10 years ago) was because they only do one wedding per day. That was important to us because we didn’t want to feel rushed and we didn’t want to compete with another wedding for time and attention. While planning our vow renewal, we felt like the resort still follows this practice of only one ceremony a day (wedding or vow renewal). But, if this is important to you, it’s best to confirm with the resort directly. 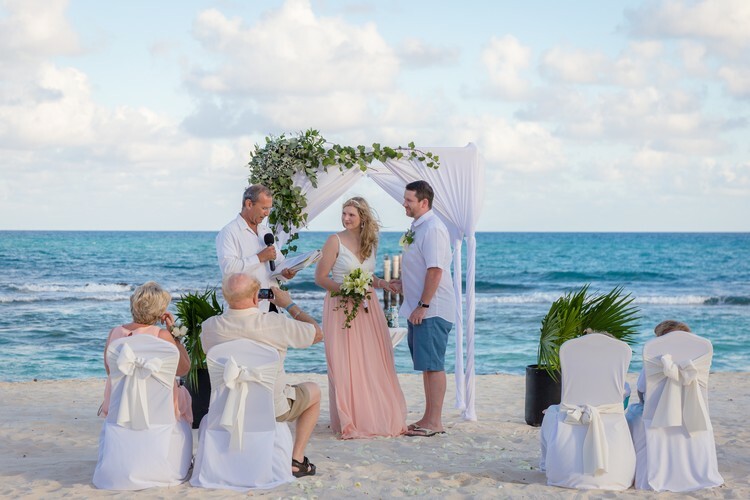 An option that was offered to us by our wedding coordinator was a Sand Ceremony. We were each given a bottle with a different colour sand (we had light blue, white, green and tan). After we renewed our vows, we each poured a little sand in a little jar. The result was a colourful swirl of sand that was contributed by each of us (see photo below). It’s meant to represent our family bond. This was a really nice way to involve our boys and it gave us something to take home to remember the day. The jar is now sitting on our fireplace mantle in the living room. Something we didn’t expect, and was a nice surprise, was that the minister was the SAME person who married us 10 years ago! What are the odds of that? When we were introduced to the minister Cameron immediately recognized him. His response was, “about 10 years now”. “You married us 10 years ago!” was our response. He was thrilled to learn he would be marrying us a second time. He was also happy to see that our union had produced two cute boys, too. We could tell that this moment was special for him too. The vow renewal speech he prepared was incredibly heartwarming. If we’re being honest, we actually loved those words more than our actual wedding vows! 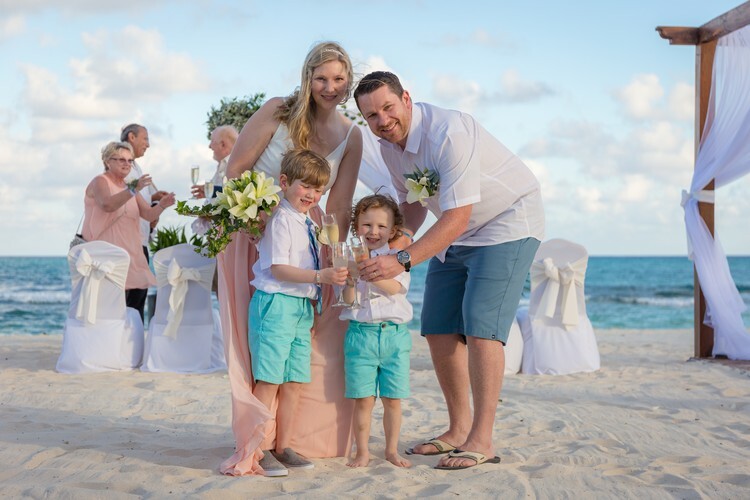 At the end of the ceremony the adults had champagne and the boys had fresh lemonade. The lemonade was a big hit for them, especially Connor! Braydon was so excited to wear a tie. He wanted to wear this outfit every day. Our clothing was purchased at home and we brought it with us. Nicole’s dress is from BHLDN, the boys clothes are from The Children’s Place, and Cameron’s shorts and shirt is from Quiksilver. 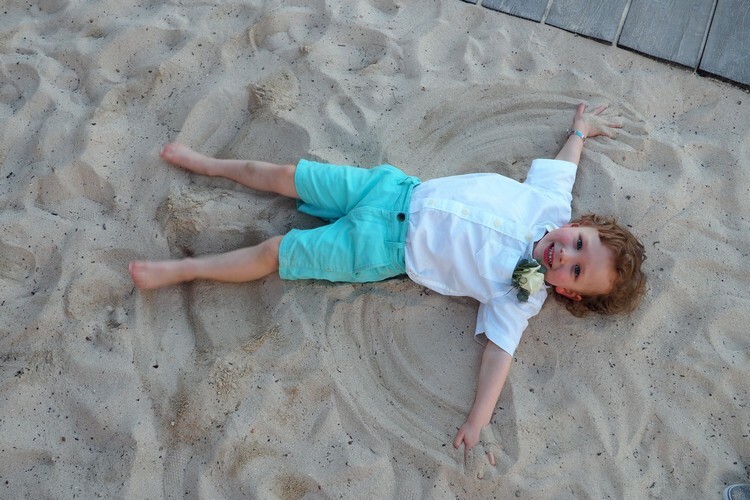 Who says you can’t make Sand Angels? Braydon didn’t make it. He fell asleep and needed to be carried back to the room. 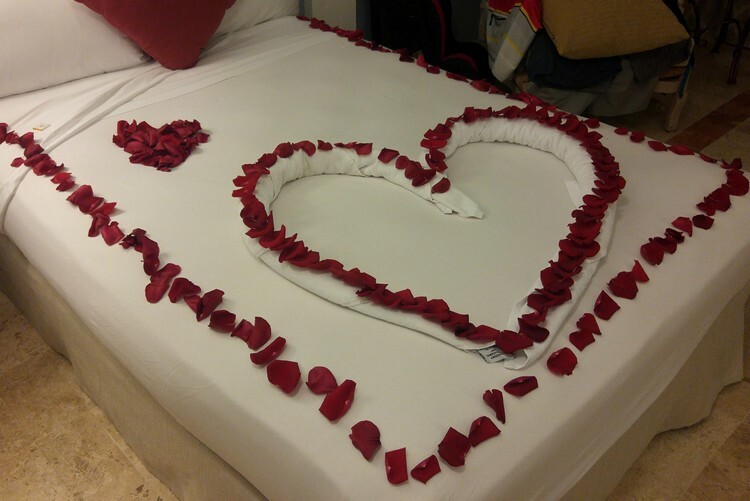 This is what our bed looked like when we returned to our room after dinner. We appreciated the small details the hotel provided. 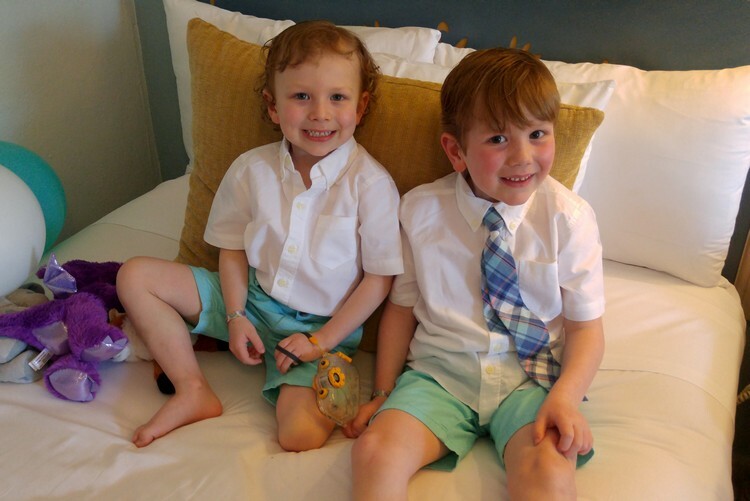 We had a nice welcome package, an oceanfront view, champagne upon arrival and stuffies for our boys. It was clear that the staff wanted to make our visit special. They were successful. 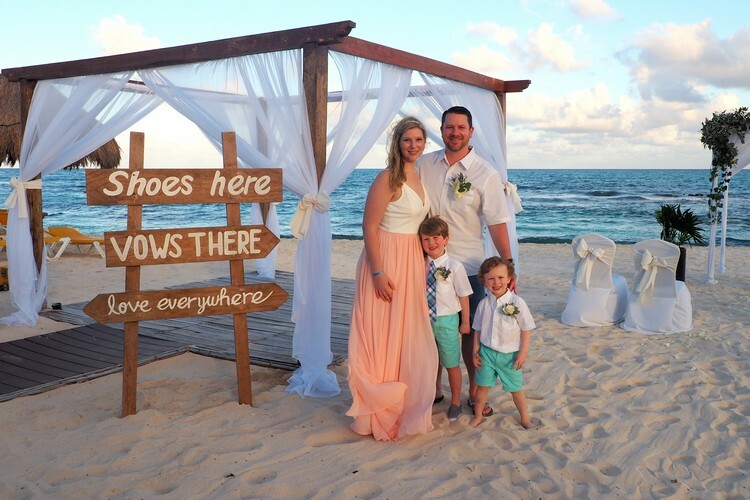 We had a fun vow renewal ceremony and would recommend the experience. The planning process was easy and the hotel did a great job executing the plan. 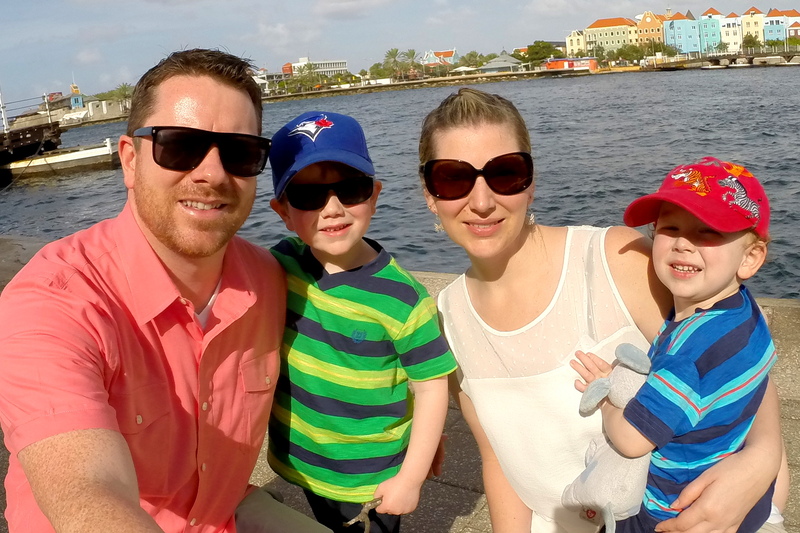 We didn’t have to worry about anything, which gave us more time to enjoy our family vacation. 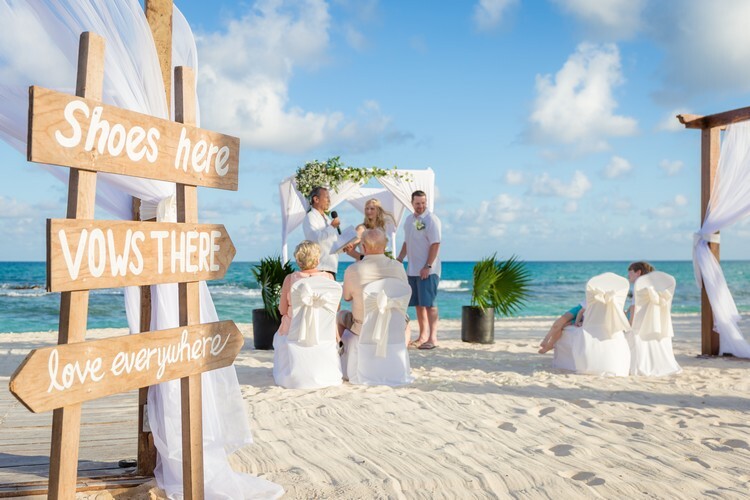 If you’re considering a vow renewal, do it! You won’t regret it. We’re thankful for the memories that were created on this trip. It required a little more planning and money, but it was so worth it. We will cherish these memories and look back on this experience with big smiles. 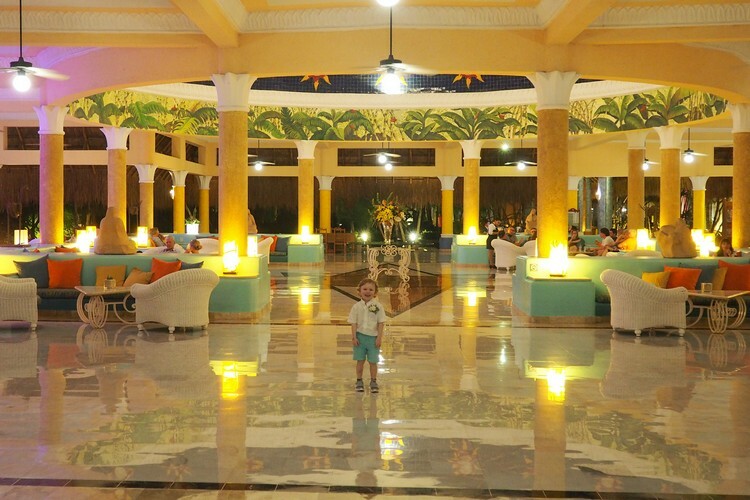 We wrote a review about this all-inclusive resort from our visit 5 years ago – read the post here. We also made a short video about the resort – watch it here. We will do another update soon that has recent photos. We were impressed by how well the resort is maintained. It looks exactly the same way it did 10 years ago. More info about the resort can be found here. Thank you. It was a lot of fun and a really great family memory. Your boys r beautiful and it was delightful 2 read about. This is perfect! Just out of curiosity- how much would this approximately cost if we went with a basic package?